Some days, certain types of projects can make a person feel like a hamster going ‘round on a wheel. I experienced this when trying to contact my internet service provider about a mistake on my bill. The phone number on the invoice got me a computer. Punching the appropriate numbers got me a human who said I was at the wrong department. She transferred my call to a fellow in New York who couldn’t help me because I’m in Texas. His transfer got me back to the computer. Punching in numbers got me the wrong department again. I am a very patient person. However, after two of these fruitless loops, I decided to take a 24-hour break. The next day, reaching step #2 and determined to not go through the loop again, I raised my voice and put some stone in it. “Do not transfer me to New York! I talked to him twice yesterday and he can’t help me because I’m in Texas. I need to talk to the Southwest district office.” That resulted in a transfer to a lady in the Connecticut office, who also could not help me. She transferred the call back to the computer. After two days of this exasperating exercise, my husband encouraged me to stop wasting time. He said they’d probably only give me a ten-dollar credit anyway. I almost listened. Instead, in a last-ditch effort, I used an Internet search engine to find an email contact for the company. I found it on a website called GetHuman.com*. Tired and exasperated, I wrote to tell the CEO I was “stuck in a loop” and got a very quick response. His office was so apologetic they cancelled my entire debt for the month. I was so relieved and happy, I felt like dancing. Maybe I did. Being stuck in a loop for such a long time and then finding an easy fix made me think about how many times I’ve given up before finding a solution. How many times have we heard, “You can’t fight city hall,” “You can’t win with big business” or “Don’t argue with the IRS”? One thing is certain—a person doesn’t get off the wheel of frustration by resigning herself to running around. Resignation and acceptance may bring temporary relief of the stress but it is not a solution. Sometimes one has to jump off and take a nap. Sometimes she must kick and scream and threaten to bite. 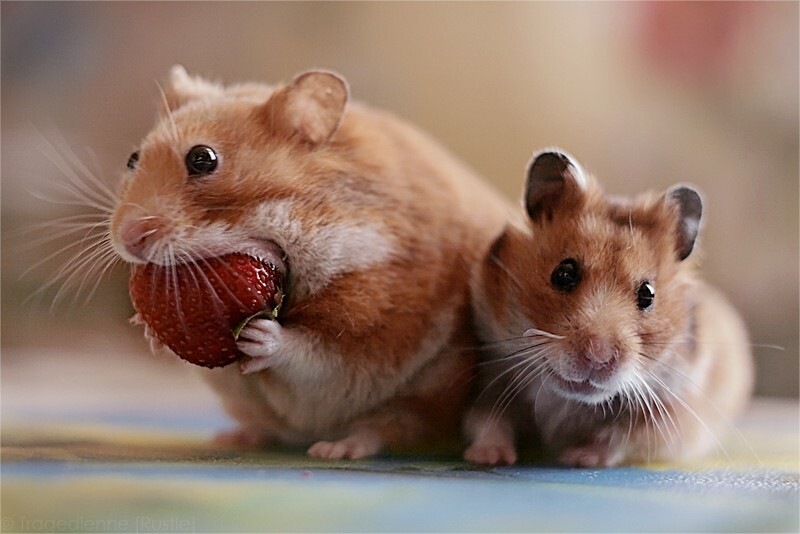 Once in a great while, this patient but persistent hamster is rewarded with a strawberry. This entry was posted in Short Takes on Life and tagged hamster food, hamster on a wheel, internet service provider, patience and persistence, rat in a maze, thinking outside the box. Bookmark the permalink.